Our own Benjy Epting generously offered to take me alligator hunting a few years ago, and the only catch was that I needed to draw a SC tag. He thought my chances were about 50% for first year, 80% by second year, and 100% by the third year. Naturally, I didn’t draw until the fourth year. My alligator measured out at 7’-0” and weighed 65#. I used a Hill style bow of my own make that’s 48# @ 29”. The arrow, preordained “Lucky”, was custom from my buddy Gary at D&M just for this trip and only the last 6” survived the annoyed alligator’s incessant biting of anything nearby. My thanks again to Benjy for his generosity and hospitality! I see a new pair of boots and a back quiver Congrats! CONGRATS! This brings back fine memories for me. 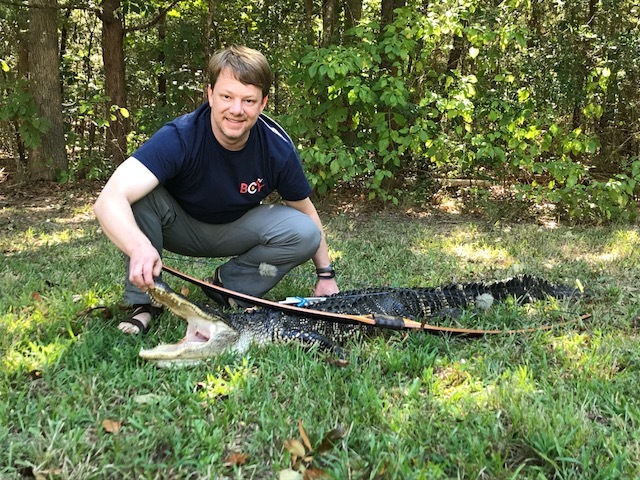 Gator hunting is a blast! Thank you for sharing!